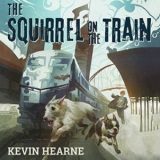 The Squirrel on the Train by Kevin Hearne Oberon’s Meaty Mysteries #2 in which Oberon proves squirrels are EVIL! Hearne treats us to a suspenseful murder mystery with high tech gadgets, a shifter and more. 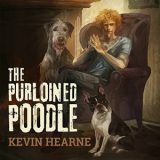 The world’s number one Irish Wolfhound detective Oberon is on the case with his trusted friends. I adore Oberon the Irish Wolfhound who is Atticus O’Sullivan’s companion in the Iron Druid Chronicles. The series mentions Oberon’s Meaty Mysteries and I knew I had to listen. The Purloined Poodle is the first and while it takes place in the world of the Iron Druids it is more of a mystery that Oberon solves with the assistance of Atticus. Suspenseful and hilarious this was splendid.